1BR/1BA condo with a true separate bedroom, sleeps 4. This penthouse condo has gorgeous direct gulf views, is completely remodeled and is fully equipped for a great vacation. The building does have an elevator. Wall to wall, floor to ceiling sliding glass doors maximize the breathtaking view. The sliders open to the screened lanai from the bedroom and living room. The fourth floor location affords the security to leave the doors open at night so you can fall asleep to the sound of the surf and the sea breezes. The condo has a true bedroom, offering quiet and privacy. This is particularly convenient for an extended stay or when sharing the unit with children or another couple. The kitchen is fully equipped with a refrigerator with ice maker, stove, dishwasher, microwave, blender, coffee maker and all that you need to cook and dine comfortably. You will find 2 flat panel TVs with cable. Living room TV also has a Blu-Ray/DVD player. I have an iPod dock/clock radio, CD/mp3/radio combo, and free Wifi. There is also a small book and DVD library in the unit. Two 1-speed bikes, beach chairs, beach umbrellas, beach toys and beach towels are available, free of charge. A wagon is provided to help get your belongings to the unit. The unit sits slightly behind the beachfront building but it is about as close to beachfront as you get, without paying beachfront prices. Located at the quiet, west end of the Sundial complex, it is steps to Sanibel's pristine beaches. PLEASE NOTE: This unit does NOT include use of the amenities provided by the resort such as fitness room, hot tub, loungers and kayak. If you desire these amenities, you must rent through the resort. Most people do not find the resort amenities worth the extra expense. You WILL have use of 4 of the 5 pools on the property. Only the main pool is excluded. I provide chairs, umbrellas, beach towels and other gear. There is a pool right outside my building. The salon/spa, pizzeria, market and all resort restaurants, including the tiki bar, are open to the public. The tennis courts are considered public and may be reserved through the resort. You will find "Sanibel Delight", is an ideal retreat for a family vacation, honeymoon or relaxing getaway. 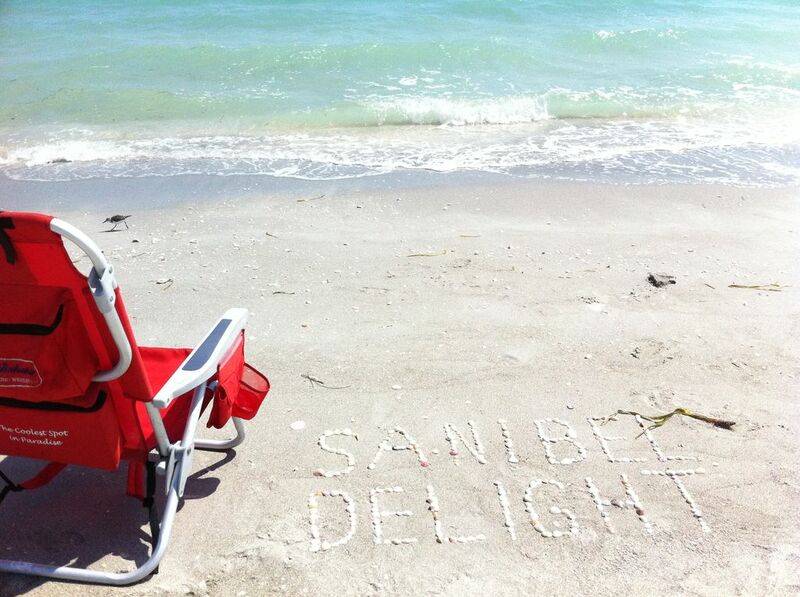 Come stick your toes in the sand and find out what Sanibel has to offer . I grew up in Louisville, KY. My mother always called me 'nature girl'. From my youngest photos, I seemed to always have an animal nearby. I spent most of my life working with animals in one capacity or another, so when I visited a friend on Sanibel and discovered the natural beauty of the place, I was hooked. In the mid 1980's, I took a job working at C.R.O.W (Care and Rehabilitation of Wildlife), the wildlife rehabilitation hospital on Sanibel. I got to know the island and it's unique, nature - friendly attitudes. I left that job after a couple of years but have continued to vacation on Sanibel regularly. I never found any place else that brought me the peace and tranquility of this island. It is a special place. I searched for several years before finding just the right property. When I opened the front door and saw the phenomenal view, I knew my search was over. Although it is not technically beachfront, it's pretty darn close! This condo has everything I looked for on my vacations, washer/dryer, comfortable sized rooms, large screened lanai. Add to that the fact that nothing can ever be built in front of my unit, to spoil the view, I was sold. Although I am more of a beach person, it is nice to have a pool right outside the building and the complex is NOT next to a public beach, so it isn't crowded. The 4th floor location makes it safe to sleep with the doors open, listening to the surf. It is a truly great place to spend time. 15 miles of famous shelling beaches are just steps outside the condo located at the private west end of the resort. The gulf of Mexico is just outside the building with excellent views from the screened lanai. Ocean front dining, salon/spa, market. This unit does not offer resort amenities. You will NOT have use of the fitness room, hot tub or resort pool. Four other-site pools ARE available. Sanibel has a village atmosphere with boutiques, bistros, and various shops dotting the main road. Hop on a bicycle and ride the 22 miles of bike paths, exploring all the island has to offer. Sits behind the beachfront building but angled so it provides a beautiful (almost) beachfront view. Bath, kitchen and beach towels are provided. Magnificent beach view with floor to ceiling wall to wall sliders. Seating for 4 inside and also on balcony. DVDs and video tapes including some children's programing. Screened balcony with ocean view. Chairs and table for lounging. 2 privately owned bicycles available for guest use. They are stored in the bike rack, outside the storage closet or in the closet. Helmets are located in the storage closet. Tennis and Pickleball are available for a fee. Call the resort for pricing and reservations. A wheel chair will fit the elevator and into the door but will not fit into the bath or bedroom. The island also experiences brown outs so it could be difficult to get off the top floor when elevator is down. The unit has a magnificent view and will not disappoint. It includes an in unit washer/dryer, 2 bicycles, beach chairs, sand toys, umbrellas, coolers, linens, a well supplied kitchen, and a small library of movies, books, games and puzzles. PLEASE NOTE: This unit does NOT include use of the resort amenities such as fitness room, hot tub, loungers, kayaks and children’s programs. If you desire these amenities, you must rent through the resort or Royal Shell Vacations and pay an additional 150.00/person/week. Most people do not find the amenities worth the extra expense. You WILL have use of 4 of the 5 pools on the property. Only the main pool is excluded. There is a pool right outside my building. The salon/spa, pizzeria, market and all resort restaurants are open to the public. The tennis courts are available for rental through the resort. I haven’t been able to stop talking about Paula and her wonderful place. The attention to detail from Paula starting from the moment you book. Her timely and personal response to any question asked! She made it all very easy. Her condo was just perfect. The view better than We could ever imagine. Everything we could ever need available in her condo with information of the surrounding area was perfect. We loved her place and Sanibel Island! We will definitely go back! Condo is immaculate, super clean, has everything that you could ever want. Paula is responsive to all emails and calls. We locked ourselves out of the condo and she came right over to give us another key. I've stayed in over a dozen VRBO's and Paula's condo is at the top. The location is great, steps from the beach. Kitchen is filled with all utensils you could use. Will plan on staying here again and again and will be telling all of our friends and family. Great beach condo! Well-stocked with everything you need for a week at the beach! We enjoyed our stay at Sanibel Delight from 12/23-12/29/18. We were first-time visitors to the Sanibel area and were looking for a comfortable, quiet place for a relaxing holiday get-away for my husband and me. We found the condo to meet our needs and provide us with a great beach week. The condo is very clean and smelled fresh upon arrival. It was very well furnished with plenty of linens, pillows, towels, and dishes. The included beach accessories were a huge plus! There's a large storage closet full of everything you need for a day at the beach (which is just steps away from the condo). The condo complex is nice as well, almost eliminating the need to leave at all. Make sure to get reservations at Shima for some great hibachi and sushi. We mostly ate in the condo and took snacks for days at the beach. The king-sized bed was comfortable, and the lanai was fabulous. We enjoyed having the smart TV in the living room to be able to watch movies/Netflix at night. Only issues we had were with the cookware (scratched up Teflon pans) and somewhat-uncomfortable living room furniture (no couch pillows). The owner is very informative and responsive and left tons of info about the area in the condo. Overall, we enjoyed our week at the beach and would recommend Sanibel Delight to anyone visiting Sanibel Island. Thank you for taking the time to write a review. I am sorry to hear about the pots and pans. I buy new ones every year but people insist on using metal utensils in Teflon pans. I will look into getting some new ones, again. As for the sofa pillows, I removed them due to sanitation concerns. I’m glad you had a good stay. I strive for a five star rating and I am sorry I fell short. Thank you for bringing your concerns to my attention. My husband and I have been visiting Florida beaches for over 25 years. However, Paula’s condo truly tops our list as the best kept home away from home. Her unit is well kept, clean, comfortable, and affordable. Her attention to detail is superb with added essentials in every room to include a small bag of household tools, ice chests, small scissors and sewing kit, bicycles, wagons, sand dippers, fishing poles, etc. This unit truly felt like home. Drawers, cabinets, and closets were neatly stocked but not cluttered or crowded. Decorations and furniture were simple but quality. No need for overdecorating a condo just to leave out all the home essentials. Great job Paula and thank you for providing a wonderful place for people to visit and relax. I am so happy you enjoyed the condo and the little extras. I have traveled quite a bit and have tried to supply those things you don't pack but always wish you had. As you said, it is the little things that can make a trip easier. I can't take total credit though. Some of the items, like the fishing poles, were donations from previous guests. I don't know a thing about fishing, so I wouldn't know where to begin. I noticed someone stocked up the tackle box, over the summer. As long as there is room, I'll hang onto these things for others to use. Thank you for taking the time to write such a lovely review. Great views of gulf, tastefully decorated condo,, fully equipped kitchen, spacious lanai, comfortable bed,, awesome beach equipment, made trips to beach super easy, very responsive owner! We recently spent 3 nights in Paula's unit. We enjoyed the 4th fl. view and easy beach access. Paula has everything one would need to enjoy the condo and the beach. We liked the fact that although we had direct beach access, we were also tucked away in a quiet spot. Getting the beach chairs from her storage unit to the beach was quick and easy. The master bed was very comfortable and we enjoyed being able to open the sliders and to go on the balcony from either the bedroom or living room. Many rentals feel like a rental, but Paula's condo truly feels like you are staying at a friend's place who has thought to provide you with all types of extras: games, sand stuff for kids, tv in the bedroom & living room (and the option to use your Netflix), and plenty of furniture to relax on which isn't always the case with a 1 BR unit. There was even a drying rack on the patio. These seem like little things, but when you are staying somewhere, it just makes life easier. We look forward to visiting again in the future. Only thing we would have liked (not in Paula's control) is a faucet or hose to use when you come off the beach and want to rinse off the sand. I am glad you had a good stay. You are right about the quiet spot. A perk of being at that end of the resort is it is never crowded. I'm sorry you didn't find the rinse station. There is a shower at all exits from the beach but the one closest to me is difficult to see, since it is tucked into a cubby hole on the end of the beachfront building. If you don't go over there looking, you wouldn't likely notice it. If you return, I will explain it in more detail. I know what you mean about desanding. Sanibel is a naturally beautiful island that is known for it's preservation of wildlife and habitat. Protected from over development, it is unique among other vacation destinations in Florida. No high rises here. The J.N 'Ding' Darling Wildlife refuge takes up nearly fifty percent of the island. Drive, walk, bike, canoe or kayak through the refuge to see the hundreds of resident and migrating species of birds. There are 50 species of fish, 230 species of birds and 250 kinds of shells found in and around Sanibel's waters. Experience the wildlife side of Sanibel by stopping at CROW, our state of the art wildlife hospital, for an education about the wildlife found on the islands and the injuries that often occur from our human activities, as well as how to avoid being part of the problem yourself. The Sanibel Captiva Conservation Foundation can give you an understanding of Sanibel's flora as well as their involvement in the Sea Turtle nesting program. There are many boutiques scattered around the island for the shopper in the group and more excellent restaurants than you can possibly experience in one trip. Enjoy a drive to Captiva and discover its unique character, great sunsets and dolphin-watching cruises. Stop in for a drink at the gulf front restaurant, 'The Mucky Duck' or for a scrumptious Katie cake at the famous 'Bubble Room'. Off-island, in Fort Myers, you will find the very educational Edison/Ford Winter Estates. Enter another time and see where these two great entrepreneurs developed a friendship and got some of their inspiration. Harvey Firestone was next door too. I am not a museum person, but this place is fascinating! If nothing else, you an enjoy the estate gardens and the river front view. Baseball spring-training is a big draw to the Ft Myers area. The Minnesota Twins and Boston Red Sox train here annually. The city is also in negotiations with the Washington Nationals. Theater, concerts, museums, and a surprisingly active downtown round out the Ft. Myers experience. But once you are on Sanibel Island, you probably won't want to leave! The Key West Ferry is 12.5 miles away at Fort Myers Beach. Take a day trip to Key West or stay the night. Golf: There are two top rated golf courses on the island, just minutes from the condo. Another is located just 15 minutes off island, and dozens more courses can be found around town. CHECK IN 3 PM, CHECK OUT 10 AM NO PETS NO SMOKING in unit. On lanai is ok. Credit card required for security deposit 3% fee on ALL cancellations. Refund, minus the fee, will be issued, if cancelled 60 days PRIOR to arrival. AFTER 60 days, refund is issued, if unit can be booked for the same rate and period of time. A partial refund is issued, if rented for a lesser rate or shorter stay.